You will also need some sort of tape to make the triangles. I'm using washi tape but scotch, striping, or painter's tape would also work just fine. 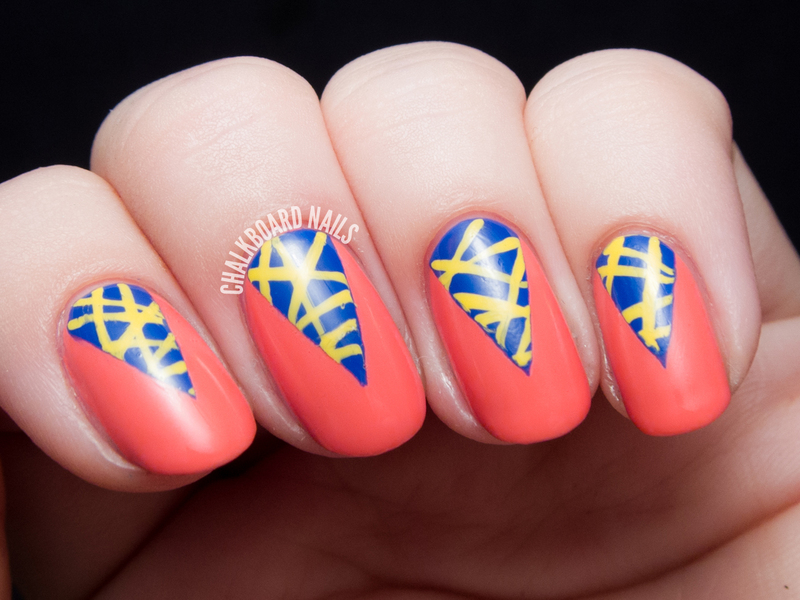 Paint your nails with 2-3 coats of Coral Reef. Let dry completely before moving on to the next step (I like to use a quick dry topcoat to cut down on waiting time). Apply two pieces of washi tape to your nail to create a triangle near your cuticle. Press down to ensure a good seal with your nail. Paint over the exposed area with In Prompt Blue. Working quickly, use a small nail art brush to paint thin stripes of Lightening going in all different directions. Carefully remove the washi tape and finish with topcoat. 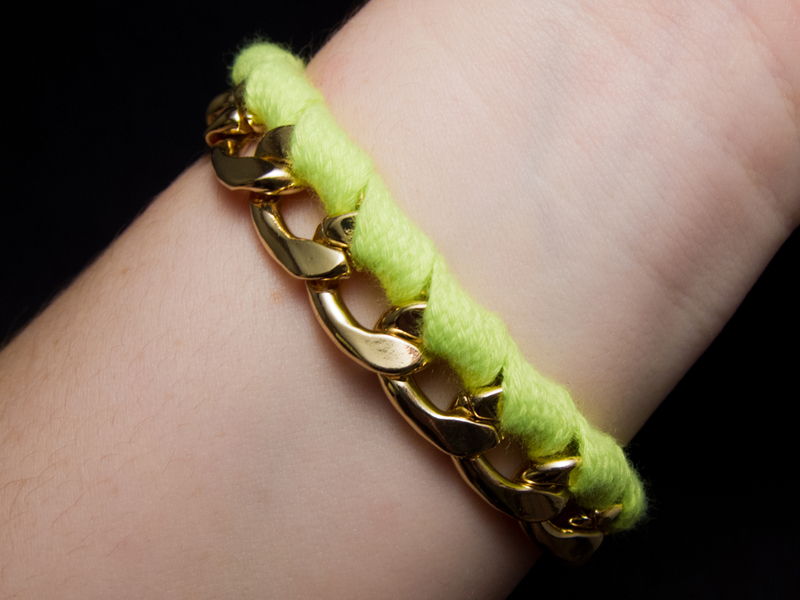 I paired this summery look with a neon and gold chain bracelet from BaubleBar. While I don't think this one is still up for sale, you can browse their extensive selection of neon and chain bracelets here. Enter the Sally Hansen #IHeartNailArt contest at sallyhansen.com for a chance to win $500 and a trip to NYC to compete in the grand finale. The grand prize winner will become a Sally Hansen nail art ambassador and receive $2000! No Purchase Necessary. See Official Rules for full details. Disclosure: This post is sponsored by Sally Hansen. Products provided by PR. These are so fun and eye catching! Very nice tutorial too. Awesome! 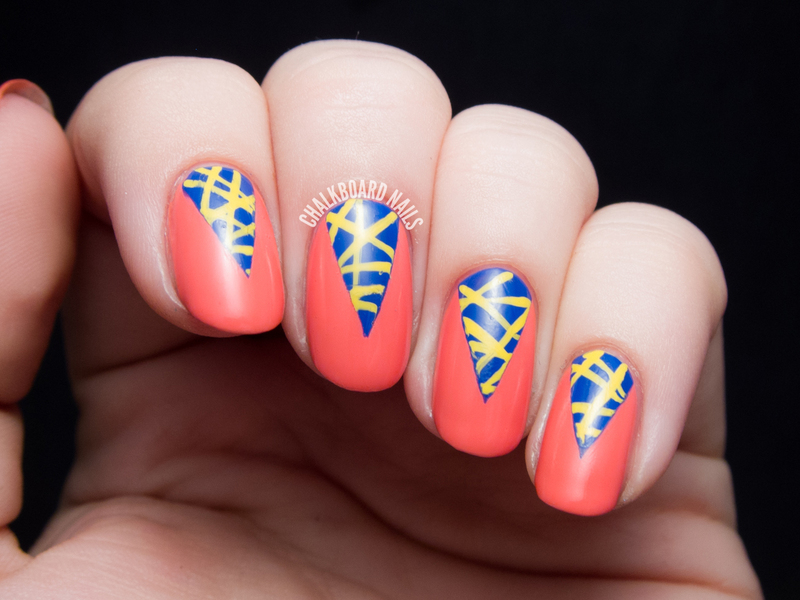 I wanna try some of your designs @chalkboardnails! I'm definitely trying this out! So cute and fun! Perfect pops of color for these hot days! I love the color contrast of these! Very striking! I think this is perfect for summer. And shame on sally hansen for not getting you in the naild it ad on youtube advertising nail art. I wish your amazing talent would've been recognized. I like! Does the washi tape help with keeping clean edges even though you don't remove the tape immediately? I like washi tape for nail art because it makes a good seal with the nail but can be repositioned if you don't set it down right the first time. It's a little heartier than scotch tape, too. You still want to work as quickly as you can to avoid the tape pulling up the polish as you work with it. Thanks Sarah, I'm thinking of doing something with tape tonight so I might pull out the washi then!